One of Whistler’s distinctive innovations was his use of musical terms such as harmony, nocturne, and note in titles of his works. Its purpose was to evoke the “purity” of music, an art form then considered to be independent of narrative content. 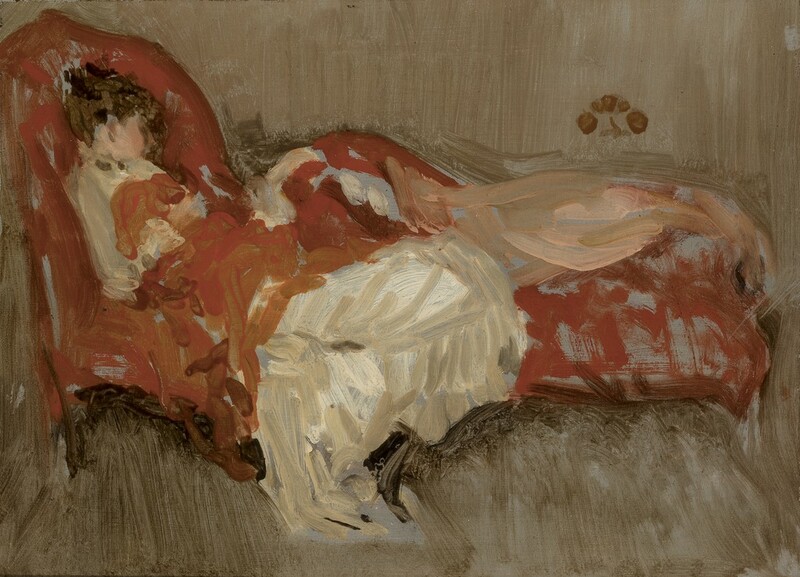 Note in Red: The Siesta portrays Maud (Mary) Franklin, the artist’s model and mistress, lying on a red divan. Quickly and sketchily executed, her form, enveloped within a voluptuous dress that trails along the floor, suggests an unposed moment, a nap for the weary model. Whistler repeatedly returned to the theme of recumbent women and treated the subject in a thoroughly modern way. The apparent immediacy with which he painted Maud emphasizes his presence and their personal relationship. In its candid depiction of a private moment and its assertion of his persona and process, this work attests to Whistler’s status as an early proponent of modernism.